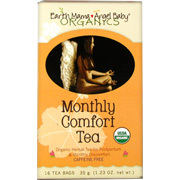 Formerly known as Postpartum Tea, Organic Monthly Comfort Tea is a calming, soothing, USDA Certified 100% Organic and Certified Kosher blend created to jumpstart recovery immediately after childbirth, and for "that time of the month" when hormones are raging and your uterus and you could use some extra care! 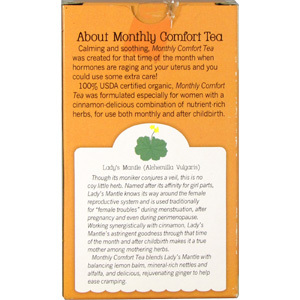 Formulated especially for women, with a Cinnamon delicious combination of nutrient rich, 100% organic herbs, Organic Monthly Comfort Tea blends astringent Lady's Mantle with balancing Lemon Balm, mineral rich Nettles and Alfalfa, and rejuvenating Ginger to help ease cramping. Organic Monthly Comfort Tea is a natural for our menstruating mates and perimenopausal pals, and perfect for recuperating postpartum mamas. Sip a cup within an hour after childbirth and then 3-4 times a day for a week. For monthly discomfort, sip as often as needed! In biodegradable, easy to brew tea bags with compostable overwrap, and the 100% recycled and recyclable cartons were produced using wind energy. Steep, sip and enjoy, mama! Not for use during pregnancy. Safe to use while breastfeeding. Are all of your products really organic? It's a sensible question, especially in light of the many products falsely claiming to be natural or organic. You can click on Read My Ingredients on each product page to find out exactly what is in each product. 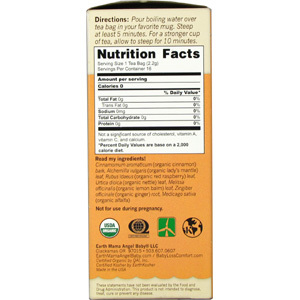 You can also check our labels for the organic certifier for extra assurance. 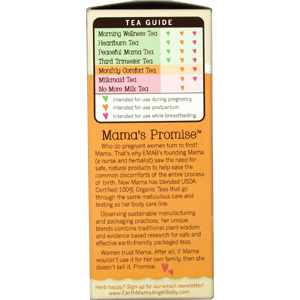 All Earth Mama Angel Baby teas, Angel Baby Bath Blossoms and Postpartum Bath Herbs are USDA Certified 100% Organic. Angel Baby Shampoo & Body Wash, Calm & Clean Hand to Toe Wash, Natural Non-Scents Hand to Toe Wash, and Happy Mama Hand to Toe Wash are USDA Certified Made With Organic Ingredients. Angel Baby Lotion and Earth Mama Body Butter are NSF/ANSI 305 Certified Contains Organic Ingredients. Each Earth Mama Angel Baby product has as many organic ingredients as we can pack into it, but some essential ingredients aren't available as organic yet. And of course Earth Mama products are free from toxins and any worrisome ingredients, like artificial preservatives, fragrances, dyes or surfactants. But, what does "organic" really mean? It means that the plant was grown with respect for the earth, the soil, the farmer and you, the consumer. Certified organic farms adhere to strict standards, growing crops without the use of harmful pesticides or the usual dose of toxic chemical fertilizers. Manufacturers of certified organic products have to undertake a monumental process that assures consumers of the purity of each ingredient, process and final product, through every stage of manufacture. Click on over to Mama's Reading Room and check out the articles under the heading "Why Organic?" for more information. Why aren't ALL of your ingredients organic? Simply put, some ingredients just don't exist in an organic form, and some ingredients are not available certified organic. Sometimes the herbs we use are not cultivated, they grow in the wild and are harvested with respect for sustainability and the integrity of the plant population. Since Mama is a member of United Plant Savers, we do our best to support practices that ensure healthy population of herbs growing in the wild. You will see these herbs listed as "wild harvested." What's your position about the use of palm oil? We share your concerns about deforestation and conservation, which is why we use only sustainably harvested palm oil in Earth Mama Angel Baby products. Our passion about caring for mamas extends to Mother Earth too, and we strive to use herbs, oils and butters that are grown and harvested only in ways that honor the earth, her people and her resources. There are a lot of uneasy concerns about some of the ingredients commonly used in personal care products. Mama never wants you to have to worry about those things, so she has worked very hard to formulate the purest, safest products for mamas and babies. Over the years Mama has gathered a LOT of research, which she loves sharing, and she encourages you to educate yourself. Please visit Mama's Reading Room for informative articles on Hidden Carcinogens in Baby Care products, or Sodium Lauryl Sulfate. All Earth Mama oil-based products, salves and massage oils don't contain water so they don't need a preservative to keep out the unpleasantries that can grow there. Lotions, on the other hand (or knee, or elbow), are made by emulsifying (blending) oils and water. And because of their rich, organic and natural ingredients, they can become a perfect medium for nasty bacteria or mold. To combat that, our 100% organic preservative system is a certified organic alcohol extract of skin healing and moisturizing organic herbs. Beneficial to you, and safely preserved too! We use a simple code that is our Sell By/Best By date as well as our batch and lot code. You will find a printed number that looks like this: 201409. In that example, 2014 is the year and 09, September is the month by when the product is guaranteed to be at its best. I have an expired product - will it hurt me, or my baby? We stamp a Sell By date on all of our products as a freshness guide for our resellers and customers, but this isn't an expiration date. To be sure of the quality of our products we keep a sample from each batch of each product we make. Some products in this sample inventory are over five years old and are still just fine! That said, you should always use your own best judgment, if it smells "off," don't use it. You can extend the life of oils and salves by making certain they stay cool and out of direct sunlight. So, don't store Earth Mama Angel Baby products on a windowsill or in the trunk of your car and they should be fine for at least a year past the Sell By date. I need to know if your products will irritate my or my baby's allergies. You are the best judge of what is safe for you and your baby. You know your body best. Please look at the Read My Ingredients lists to see if any of your known allergens are in our products. If you have specific questions or concerns about product safety, allergies or ingredients, it is always best to consult with your Midwife or Naturopathic Doctor or another trusted healthcare professional who is knowledgeable about the use of herbs during pregnancy and when breastfeeding a baby. I am vegan, are all Earth Mama products vegan and cruelty-free? Yes they are, certified vegan in fact! We use no animal products (like lanolin), and our balms are made using plant based wax instead of beeswax. 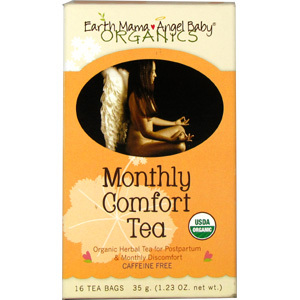 Organic Monthly Comfort Tea - 16 ct., (Earth Mama Angel Baby) is shipped in a discrete, unmarked package. Orders are processed immediately and usually takes about 3 to 5 working days to be received. We do ask that you try it for 2 to 3 weeks to feel the full effects. Any information received is used only for order processing and shipping purposes. Your information, such as e-mail address, will never be disclosed to a third party.